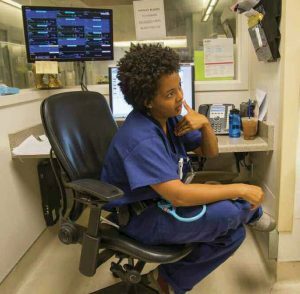 Emergency rooms are among the most stressful workplaces imaginable, but for attending physician Kara Toles ’07, stress is just part of the balancing act that makes life worthwhile. Kara Toles ’07 makes her morning rounds in the D-Pod. At this hour, as at every hour, the D-Pod bustles beneath the round-the-clock glow of the hallway strip-lights. Attending physician Kara Toles ’07 has just begun her shift in the Emergency Department of the UC Davis Medical Center (UCDMC), and for the moment, both the outgoing and incoming teams are jammed together inside the tiny, walk-through office known as the “Doc Box,” a space about the size of a janitor’s closet. As they work their way through the customary hand-off, their terse exchanges are studded with terms like “angioedema” and “metabolic encephalopathy.” Toles quickly takes charge, quizzing the three young residents and one visiting medical student who will make up her team for the day. 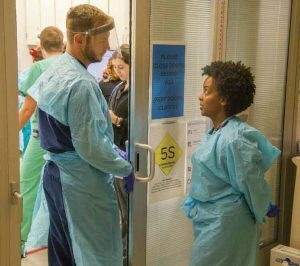 Toles observes preparations in a trauma room. Welcome to the D-Pod. That’s D as in disease, disaster and death. 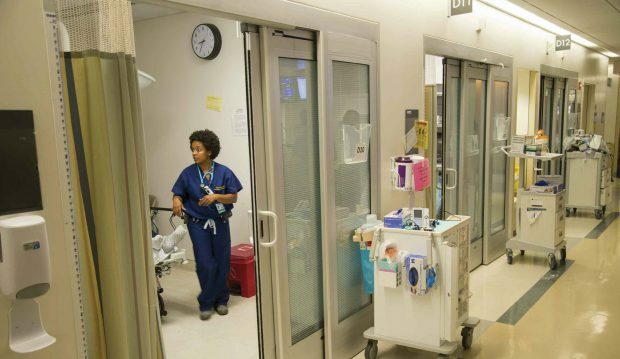 It’s what they call the section of the ER that handles the patients Toles describes as “really sick”—that is, dealing with potentially life-threatening conditions. Today, their immediate welfare and, possibly, their ultimate survival will depend on how well Toles and her team do their jobs. Fast-forward—past graduation, past a year off to regroup, past four years of medical school at UC Davis and various rotations as a resident—to her choice of arguably the most stressful of all medical specialties. Toles makes a teaching point with medical student Samantha Kerns. That balancing act seems to be a lifelong pattern. At Pomona, for instance, she solved her early battle with stress, in part, by choosing a less traditional path into medical school, switching her major from neuroscience to Black Studies because it allowed her to break away from the sciences and spend more time exploring her identity as a Black, queer woman and how to incorporate social justice into her practice as a physician. Toles checks in again on the patient with the swollen lip and is delighted to learn that the swelling is going down. After counseling him on his daily medications, she returns to the Doc Box and wolfs down a beef stick, a few walnuts and some trail mix to keep her energy level up. “You never know when something’s going to go down, so I just snack and then have a full meal after I get off,” she says. Toles awaits the arrival of a trauma patient with chief resident Taylor Stayton. With her whole team momentarily present, Toles offers to demonstrate a new technique for resolving a dislocated jaw without having to put fingers inside the patient’s mouth, but as if on cue, events begin to speed up, postponing the demonstration and sending residents scrambling. First, there’s a new analysis of imaging for a patient suffering from an uncontrollable tic, identifying a potentially deadly subdural hematoma—blood pooling between the skull and the brain. Then a new patient arrives with a badly broken wrist, the result of a skateboard accident. That’s followed by another patient showing troubling signs of gastrointestinal bleeding, and another suffering from weakness in one arm and leg following a traffic accident, and another suffering from a bizarre condition called subcutaneous emphysema, in which air escapes from the lungs into the surrounding tissues, causing strange, crinkly swellings of the chest, throat and face. 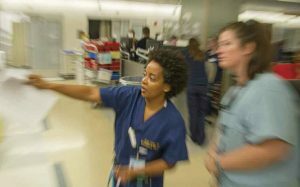 In the midst of all that hectic activity, the loudspeaker announces a 911 emergency arriving in five minutes, and Toles and the chief resident drop everything to head for one of the trauma rooms, where they join a growing crowd of attendings, residents, nurses, technicians and students. Pulling disposable plastic gowns over their scrubs and donning gloves and face shields, they join their colleagues inside the red line on the floor that separates participants from observers—and they wait. A little before 10 a.m., the patient arrives, strapped to a gurney. She’s a disoriented homeless woman with stab wounds to the neck, reportedly self-inflicted. As someone closes the glass doors to the room, she can be heard shouting threats and obscenities at the doctors as they close in to care for her. IN ADDITION TO broadening her education, Toles’s choice of Black Studies as a major had a significant impact on the kind of doctor she wanted to be. For her major thesis, she studied the relationship between the nation’s medical system and social justice, and the inequities that she saw gave her a new mission in life—caring for people on the margins. That was still on her mind a few years later as she neared the end of her medical training and began to explore specialties. The answer came to her, strangely enough, while working up a sweat on a climbing wall. Toles gets hands-on with a patient in the D-Pod. Part of that love, she says, has to do with the people she sees in the ER. Many are precisely the kind of people on the margins to whom Toles pledged to devote her career. Then too, it appealed to her because it reminded her of what she loved most about college. A crackly voice on the public address system announces, “911 in three minutes,” and as the inhabitants of the Doc Box turn to their computer screens for details, the mood abruptly shifts from laid-back to tense. “This sounds real,” the chief resident says. As Toles and the chief resident head for the trauma room, all they know for sure is that the patient has suffered a traumatic amputation of his lower left arm in a motor vehicle accident, but they know that an accident of such severity is likely to produce other kinds of trauma as well. As they gown up, they discuss their role in the coming procedure, which will be to establish an airway, if needed. Despite the three-minute warning, they’re still waiting 20 minutes later, as a crowd of observers gathers around the red line in the room and overflows into the hallway. Toles makes a point in the Doc Box. Finally, EMTs steer a gurney down the long corridor to the trauma room. On it is a male patient in obvious pain. Word spreads that he was driving with his arm outside the window when a guard rail struck him just below the elbow. A few minutes later, two highway patrol officers arrive carrying a cooler. A member of the team removes the severed arm and begins to clean it in hopes of a possible reattachment—an effort that will prove to be in vain. 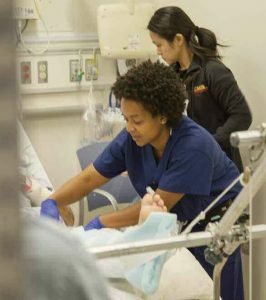 After all, UCDMC is a teaching hospital, and the ER is in many respects a big, high-stakes classroom. The residents and fourth-year students are there to care for patients, but they’re also there to learn through observation and firsthand experience. The chance to gain experience in teaching, she says, is one of her own principal reasons for working here. However, this part-time job at UC Davis is not the only iron Toles has in the fire. 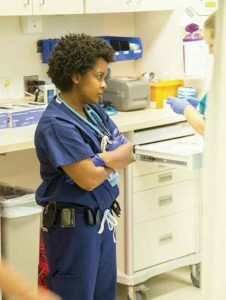 She’s also taking shifts back in her hometown of Angleton, Texas, in the ER of the small community hospital where she was born, as well as working in the much tamer environs of an urgent-care center near her home in Oakland. 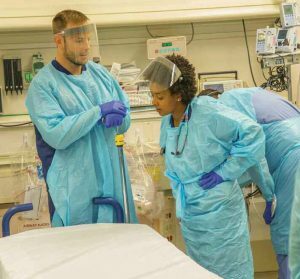 Toles and chief resident Taylor Stayton gown up for a trauma case. As her shift winds down, Toles goes out for her final rounds. “I want to visualize everyone one more time,” she explains. Then it’s back to the Doc Box for the hand-off to the next crew. Though her shift ends, theoretically, at 2, she hangs around another hour or more to make sure that the transition goes smoothly and, finally, to give her long-delayed demonstration of the new technique for resolving a dislocated jaw. It’s been a good day by her standards—she’s taken care of some “really sick” patients, but the D-Pod wasn’t so swamped that she had no time to teach. Most importantly, no one died on her watch. That’s one experience in the ER that she prefers not to talk about. When asked about it later on, away from the ER, she quickly changes the subject, but a few minutes after, as she is discussing something else, a tear rolls unexpectedly down her cheek in response to some unspoken memory.